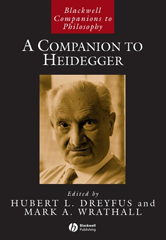 The Companion to Heidegger is a complete guide to the work and thought of Martin Heidegger, one of the most influential philosophers of the twentieth century. Considers the most important elements of Heidegger's intellectual biography, including his notorious involvement with National Socialism. Provides a systematic and comprehensive exploration of Heidegger's work. One of the few books on Heidegger to cover his later work as well as Being and Time. Includes key critical responses to Heidegger's philosophy.